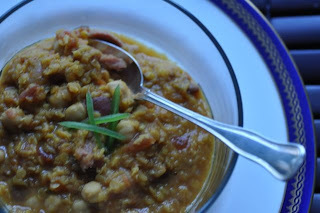 This recipe for Curried Red Lentil Soup with Jalepeno, Lemon and Ham was a big hit some time ago on Lighthearted Locavore -- and also got some attention from my editor at The Daily Meal. It's so easy and delicious. Perhaps it's because I'm married to a Southerner from Louisiana, but the idea of putting a ham bone and jalapeno pepper in an otherwise traditional Asian Indian curried red lentil (dal) soup recipe seemed like a worthwhile experiment. 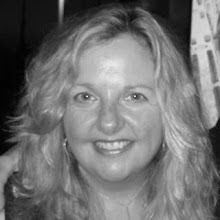 It's freezing in New York (30 degrees (F) going down to the twenties tonight) and all across the globe for that matter so a nice warm soup -- that cooks in less than a half hour -- is a great idea no matter whether your in Louisiana, New York, Tripoli or Bangladore. Better yet, I made the soup, not with locavore ingredients, but with foods I had in the fridge and pantry (it's too cold outside to shop)! 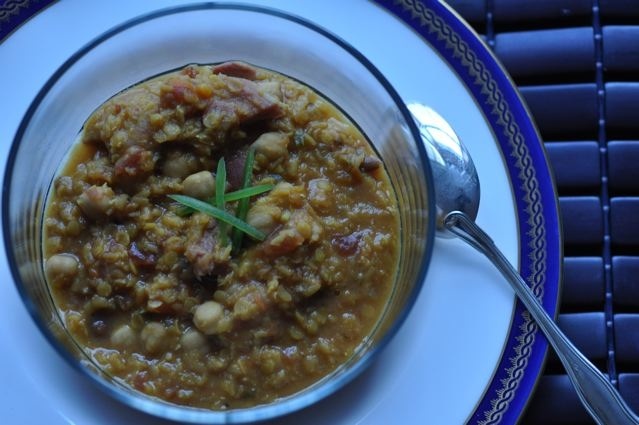 This recipe can be made vegan using vegetable stock and no ham, which is more like a traditional red lentil dal as Indians typically don't eat pork for cultural reasons. 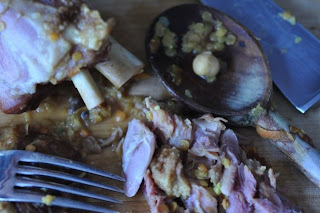 Or include chicken broth and/or leftover ham, which adds some great flavor to an already tasty dish. Play around with the amount of curry and the vegetables -- perhaps add some celery or cilantro or a can of garbanzo beans (I did which made the soup into a rich almost stew like meal). RECIPE SECRET: The addition of the lemon juice at the end is a must! 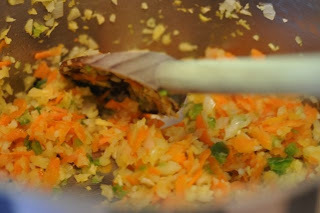 In a saucepan, heat oil and add onion, pepper, garlic, carrot and curry powder. Saute for 5 minutes, stirring occassionally. 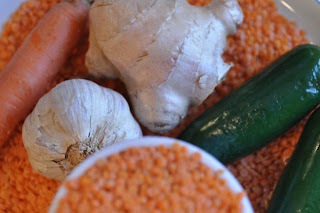 Add lentils, chopped tomato and broth (and optional ham bone or ham hock) and bring to a boil. Immediately reduced heat to low and simmer for 25 minutes until lentils are soft. If using a ham hock, remove from the soup, cut meat into 1/2 cubes and discard the fat and bone. Add salt and pepper to the soup and stir in lemon juice. Taste. 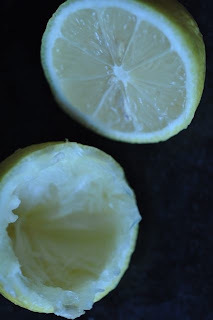 Add more lemon juice, if desired. Serve in cups or soup bowls and garnish with a thin slices of jalapeno pepper (or a dollop of yogurt). For a thinner soup, add more broth.